Andrea & Jon (#JONDREA) are two very creative individuals. Their creativity shined throughout their whole wedding day, which took place at the lovely J&D Farms in Southside, Alabama. The fruit tree orchard was a perfect setting for the ceremony. The orchard made the ceremony more romantic and intimate. The reception was held inside and around J&D farms very nice barn. Andrea & John provided games, food and dancing for the guest to enjoy all evening. Jon had created silhouettes of himself and Andrea to be used as logos on wedding decorations. Andrea & Jon's obsession and passion for all things Disney and movies. They had vintage Disney cartoons playing on a big screen by the pool during cocktail hour. 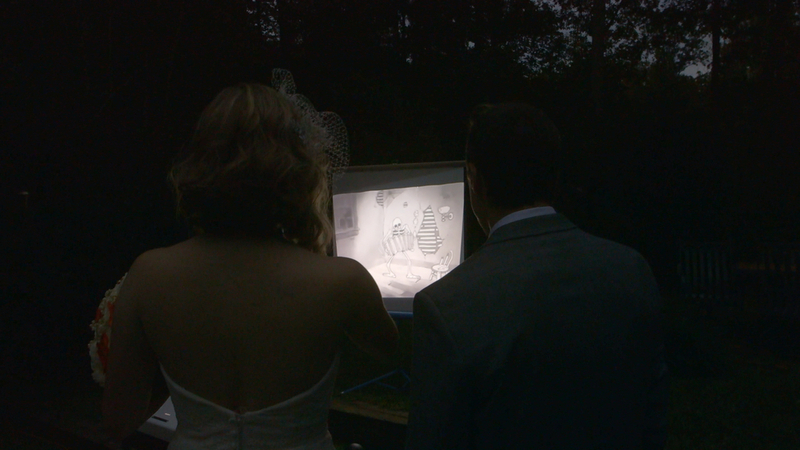 Andrea & Jon enjoy a brief moment to themselves and take in some of a cartoon. They all had Mickey Mouse ears to wear around during the day with their names embroidered on them. Jon and his groomsmen tossing their Mickey hats into the air for a photo op. Jon rode a bicycle down the aisle to the E.T. soundtrack instead of just walking down the aisle. It was awesome and epic. Halloween themed decorations added to the fun atmosphere of the wedding. Carved pumpkins lined the walkway to the barn. They had pumpkin checkers. An Orange candy bar and candy apples to name a few of the many details. Most of all, we loved how Andrea & Jon interacted. They both light up and relax when they are together. It's really cute to watch. We love that they have fun together. We love that they encourage each other to be creative. We wish Andrea & Jon all the best as they begin their new life together. Mary and Adam met in a history class at Auburn University. Since they were both athletes, he was a swimmer and she was on the equestrian team, they also had required tutoring together. They quickly hit it off. Whether it's their annual Christmas trips, traveling to London to see Adam swim in the Olympics, or curling up at home with dinner and a movie, Mary and Adam are always having an adventure. ... Mary's horse arena. Mary and Adam were married in the horse arena where Mary had spent many hours. It's so beautiful when the location has special meaning to the family! Turning the arena and barn from a working horse barn to a wedding venue, created many of the memories of the wedding. Their family and friends, from all over the world, came together to get the property ready. ... Their family and friends! Mary grew up in Alabama, went to Auburn and competed with equestrian teams. Adam was born in England, went to school in Australia, went to college at Auburn and competed in the Olympics. The result was a wonderful combination of people from all over the world. Everyone melted together and the day was full celebration and laughter! ... Their first sight. When Adam turned around and saw Mary, he became so emotional. That moment when Mary is holding Adam, and they are taking it all in, is beautiful! Congratulations Mary and Adam!! We were lucky to be a part of your perfect day! !